AlertThingy v2 - Ties you in to all your social networks ~ Android Forever! 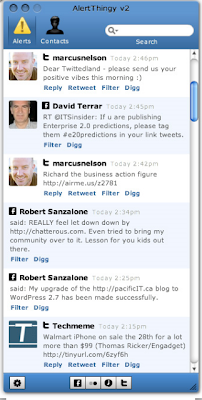 "AlertThingy v2 brings the very latest updates from your favourite social networks direct to your desktop. Plus send Tweets, update your Facebook status, upload photos to Flickr, post to Tumblr and more. With v2 AlertThingy makes it faster and easier to manage the online you. Plus you get the coolest looking RSS reader on the interweb."